Appliances like refrigerators have to conform to certain dimensions so they'll fit in any standard kitchen. 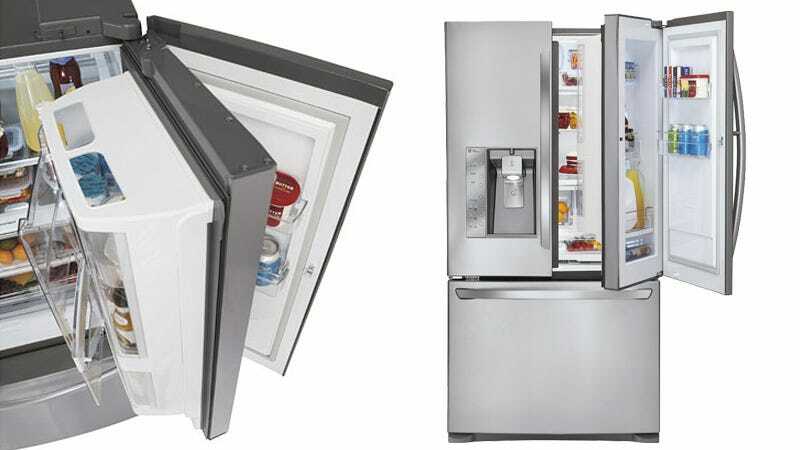 So increasing their storage capacity is a challenge—and one that LG has cleverly solved with a unique double-door design that boosts its internal volume to 30.5 cu. ft.
You're not going to squeeze a frozen turkey or a watermelon in the door's mini fridge, but it's perfect for fridge door staples—drinks, snacks, ketchup, and salad dressing that expired last year. You can still access the $3,500 fridge's deeper contents through the extra door, but it's designed with internal dividers so that the main compartment doesn't have to be completely opened if you just want often-accessed snacks. This keeps most of the cold air inside, improving energy efficiency. The extra door compartment would even be ideal for storing something like a chilled wine—the door is typically not where the coldest air circulates, so this outer door probably stays just a few degrees warmer than its deepest bowels.